Murdoch University scientists led by Zablon Njiru and Andrew Thompson have developed a simple blood test for African sleeping sickness (human African trypanosomiasis or 'HAT') which they’ve published in PLoS Neglected Tropical Diseases under a Creative Commons Attribution licence, making their findings accessible to the world. In March 2008, a team of Australian researchers led by Zablon Njiru and Andrew Thompson announced the development of an elegantly simple, low-tech and low-cost blood test for identifying African sleeping sickness (human African trypanosomiasis, or ‘HAT’). 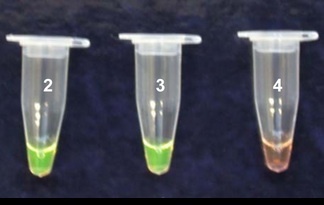 Observing the presence of infection via a colour change in reactive liquid from orange to green, the scientists have provided a way to test for this deadly disease in an endemic rural area using limited equipment. What differentiated their discovery, apart from its ease-of-use and efficiency, is the fact that the findings were licensed under Creative Commons, allowing the world costless access to their research. In their article titled ‘Loop-Mediated Isothermal Amplification (LAMP) Method for Rapid Detection of Trypanosoma brucei rhodesiense,’ the Murdoch University team – comprising Zablon Njiru, Andrew Mikosza, Tanya Armstrong, John Enyaru, Joseph Ndung’u, and Andrew Thompson – published their findings relating to a rapid and robust diagnostic test for HAT. Significantly, they chose to publish in PLoS Neglected Tropical Diseases, an open-access journal devoted to the pathology, epidemiology, treatment, control, and prevention of neglected tropical diseases (NTDs), such as elephantiasis, leprosy, schistosomiasis, river blindness, and African sleeping sickness, as well as public policy relevant to this group of diseases. This Public Library of Science journal seeks to promote the efforts of scientists, health practitioners, and public-health experts from endemic countries, highlighting the global public health importance of NTDs whilst advocating the plight of the poor who suffer from these infectious diseases. Articles published in PLoS Neglected Tropical Diseases are made available under Creative Commons Attribution 2.5 Generic licence, which the Public Library of Science designates as ‘CCAL’. Under CCAL, authors retain ownership of the copyright of their article, whilst allowing anyone to download, reuse, reprint, modify, distribute, and/or copy articles published in the PLoS journal, so long as the original authors and source are cited. No permissions are required from the authors or publishers to use the work in these terms. In this way, PLoS Neglected Tropical Diseases provides a forum for the NTDs community of scientific investigators, health practitioners, control experts, and advocates to publish their findings in an open-access format. To finance this framework, PLoS journals employ a business model in which expenses (for peer review, journal production, online hosting and archiving) are recovered in part by charging a publication fee to the authors and research sponsors for each article they publish. For PLoS Neglected Tropical Diseases the publication fee is currently $US2100. Authors affiliated with an institutional member are eligible for a discount. Moreover, authors who do not have sufficient funds to cover publication fees are offered complete or partial waivers. Inability to pay does not influence the decision to publish a paper. This page was last edited on 3 September 2010, at 18:43.